Last year I bought three cases of Girl Scout Cookies to see if I could store them and then sell them for more money later, when they were no longer available. Turns out, I like talking about ideas like this more than I like executing them, so the cases just sat under my desk for months. I eventually donated them all to Barcamp Philly (in Lose It or Lose It’s name) this past October. However, this setback doesn’t stop me from wanting to think about how someone could make more money off of Girl Scout Cookies. These cookies are often highly in demand (many people even think of them as CRACK), and they are sold by adorable little girls. It’s a pretty impressive system that is already lucrative, but think there are ways to make it earn even more money. One pricing model I’ve been thinking about is a subscription plan. As it stands now, Girl Scout Cookies cost $3.50/box. That’s already pretty expensive, but those kids are natural salespeople and the cookies are freaking delicious, so families are more than happy to pay up. 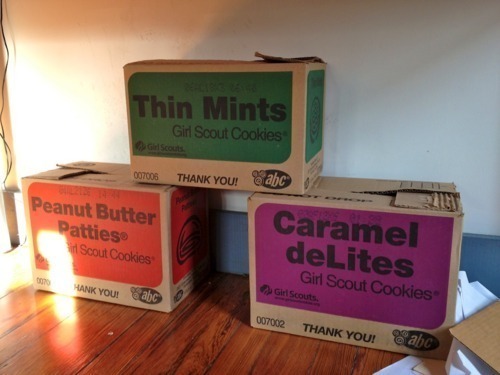 So, what if some industrious Girl Scout said that she would deliver cookies every month, year-round, for $5 per box, per month? That Girl Scout would make an additional $1.50/box, which is more than 40% more than she would normally make, and it’s all profit. If she set up auto-billing, that little scout will be rolling in the delicious delicious dough. The downside to the subscription plan are having to store the cookies under lock and key to keep the parents from going on a Thin Mint Binge™.